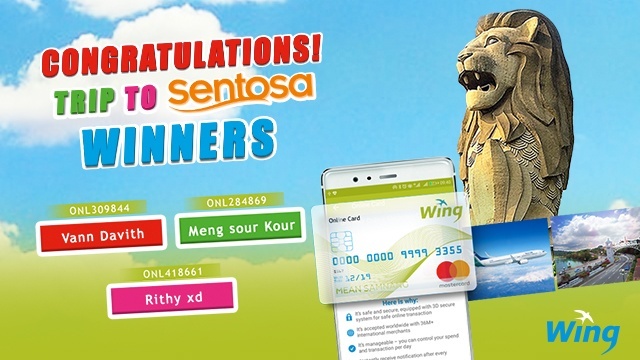 Phnom Penh – Augst 09, 2018: Wing (Cambodia) Limited Specialised Bank today conducted a lucky draw in search for three lucky winners, using Wing Online Mastercard in between January – July, 2018, whom would receive a grand prize of trip to Sentosa, Singapore. Each of the three lucky draw winners will be provided two 2 Silk Air economy class roundtrip tickets from Phnom Penh/Siem Reap to Singapore, Two-night stay in a luxury room at Sofitel Singapore Sentosa Report & Spa, including breakfast and lunch for Two, as well as a pair of Sentosa day-pass ticket. Starting from the launch of the service, the bank receives almost 100,000 transaction via Wing Online Mastercards, which clearly explains a great trust from its customers on Wing, Cambodia’s leading mobile banking service provider. Speaking at the lucky draw event, Wing Chief Executive Officer, Mr. Jojo Malolos said this is the grand prize lucky draw for Wing customers, in addition to the five monthly draws that the bank conducted, providing a prize of 100USD to 50 winners. “Once again, we would like to congratulate to the three winners. We wholeheartedly believe that our customers will continue using Wing Online Mastercards because there will be a lot of exciting upcoming offers that either Wing and Mastercards will provide to you in the near future,” said Mr. Malolos. Mastercard’s Representative in Cambodia, Mr. Tek Sophal said “We would like to pay our respect to all of the customers who support Wing Online Mastercard. We hope the three winners will enjoy their trip to Singapore”. Wing will conduct the awarding event to the winners on August 24, 2018 at Cambodiana Hotel. For the customers who have not tried Wing Online Mastercard, they can log into Wing Money Mobile App and fill in a few information in order to create the card and they will be ready to process their online transaction and enjoy various promotion such as 12% discount for hotel booking on Agoda.com, two free rides or 50% on 20 rides using ride-hailing app, Grab, and so much more.